Analysts play a crucial role in the market and have a tough job. Typically, private companies (including Pure) have policies around not sharing revenue information and larger companies often bundle different storage products together, making it difficult to tell how much all-flash customers are buying. In either case, analysts must do detailed sleuthing (vendor discussions, customer chats, channel checks, supplier conversations and good old-fashioned data crunching) to assemble a composite view of the market ... Obviously, we're thrilled that Pure did well. In 2013 (Pure's fiscal year 2014 has its year-end on 31 January), Pure Storage's S1 IPO filing said it recorded $42.733m in revenues. Yet Gartner's report above gave it over $110m in revenues (see chart), almost three times more than it actually earned. Instead of being in second place in the market, it was actually in fifth place. In 2014, Pure's S1 filing (to year ending 31 January, 2015) shows it had $174.5m in revenues. Once again, Pure's revenue – and hence position in the market – has been overstated, and Pure was not second-place behind EMC but third behind EMC and IBM. Gartner analyst Joe Unsworth said that he tells the vendors the revenue numbers he comes up with: "We send all estimates to vendors for review and publish under Gartner estimates." Dietzen did issue a warning, saying: "I want to caution everyone these numbers are from Gartner. 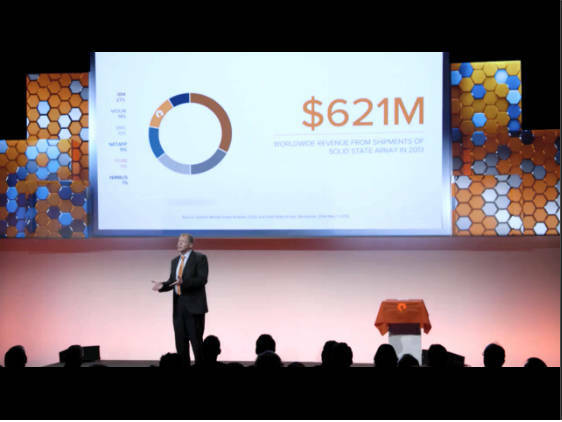 Pure Storage is a private company and does not disclose our financials ... the Gartner guys have to do a lot of detective sleuthing to build these share numbers," and then went ahead and used the Gartner numbers. It is reasonable to assume that Dietzen, as Pure's CEO, knew the real numbers, yet he referenced the Gartner numbers in his presentation. Is this a reasonable thing to do? EMC's Jeremy Burton, president for products and marketing, argues it's "annoying because it's a storage industry issue". He means that Gartner analysts try very hard to give an accurate and reasonable picture of the industry by analysing all the data they can and deriving revenue numbers, and hence market shares, from them. These they share with the vendors and, as long as they are, say, within plus or minus ten per cent then that's okay. 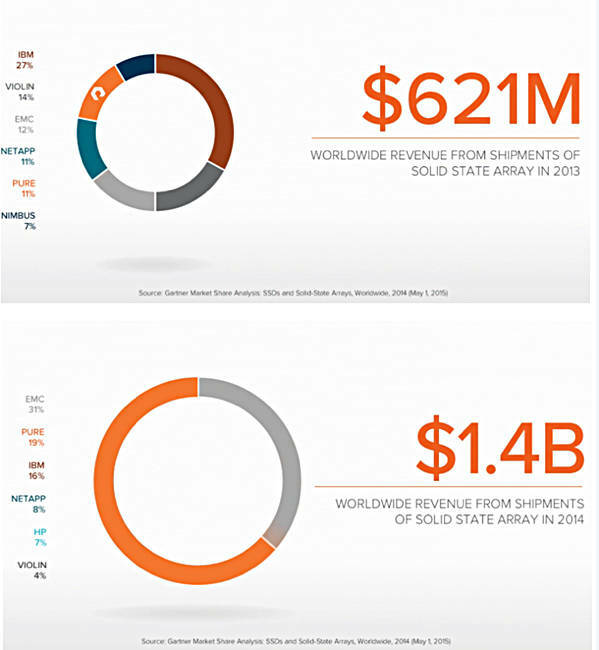 But if they are 60 per cent or more out and that's not corrected, then everyone's picture of the solid state array industry is distorted and it's in everyone's interest that the Gartner numbers are reasonable. Burton said: "For two years running the Pure numbers were wrong and Pure didn't correct them. One year might be due to an oversight. But for two years in a row it was not an oversight." He pointed out that it "has a detrimental effect on us all in the storage industry. It's up to us in the industry to work with the analysts ... The only numbers in Gartner's reports that were wrong were Pure's numbers." What about Dietzen's presentation at Transformation2 in New York? "It was rabidly disingenuous to promote the figures that are not in the right ball park. The Pure numbers were off by 60 to 70 per cent." "Like most private companies, Pure Storage has a strict policy not to disclose or provide guidance on financials to third parties. When referring to analyst market share reports, we've been careful to make it clear that these reports are cited as analyst estimates of the market – not numbers provided by or endorsed by Pure."